Syndrome Differentiation is a methodology unique to Chinese Medicine. It threads the diagnosis process with clinical treatment into a holistic web of links to determine and regulate the patterns of dysfunctions in the human body. It is seen as the essence of Chinese Medicine because it takes into account the theoretical principles, diagnostic methodologies and the modality of treatment holistically. In this process the progressive development and changes of syndromes are also considered by the physician. This paper is a systematic study of the methodology of Syndrome Differentiation in relation to its clinical applications in the treatment of diseases. To illustrate the efficacy of Syndrome Differentiation, the relationship between pattern identification and diseases is analysed to provide a guiding principle for integration between Chinese Medicine and Western Medicine. Diseases being selected include cancer, cardiovascular and metabolic syndromes. A study of renal and hepatic diseases related to lifestyle is also included to highlight the clinical efficacy of Syndrome Differentiation. The paper also includes an analytical summary of the theoretical advancements made in integrative differentiation methodology during the past five decades which it links to the recent clinical thinking and practice. The Five Methods of Differentiation were proposed in 1983i for an integrative approach to clinical medicine that combines Chinese and Western medical methodologies. The Five Methods are categorised as Disease Differentiation, Syndrome Differentiation, Differentiation of Disease Causes, Differentiation of Pathology and Physiology, and Differentiation of Principle Contradictions. This proposal provoked further studies into the logical structure of Syndrome Differentiation as a medical methodology for guiding clinical practice. First, we must examine the logical structure of the process of differentiation of the Five Methods proposed in 1983 since it is distinctly different from the current scientific thinking in Evidence Based Medicine that uses RCT and meta-analysis as the gold standard. The logic of differentiation is to distinguish one from another, and yet in mathematical logic it is to transform a function into its derivative. To differentiate, therefore, is not only to find differences but also to establish a relationship between one another in such a way that sees the transformation of one plus one into three. This logical method can be described as dialectical progressivism, as mentioned in Hegel’s Science of Logic. In the Chinese language the character Bian (辩) as in ‘Syndrome Differentiation’ (Bian Zheng 辨证) and another character Bian (辩) with the same pronunciation but different radical in the middle and which is translated as ‘dialectics’ (Bian Zheng 辩证) infers a relationship between the two methodologies of thinking (Syndrome Differentiation and dialectical). The character Bian in Syndrome Differentiation indicates the process of distinguishing the differences as well as recognising the relationship between syndromes in order to form a holistic view of development in the transformation of one pattern of dysfunction into another and the mutual relationship of such transformations in the theory of Ying and Yang. In dialectical logic, the nature of contradictions is mutually dependent and mutually transformative. This is similar to the theory of Yin and Yang in Chinese Medicine. We can therefore conclude that there is a relationship between the two methodologies of thinking. Syndrome Differentiation as a process contains the logic of dialectics in its philosophical enquiry. We can deduce further that dialectical logic used to describe the nature of contradictions is finding parallels in the latest scientific thinking. Einstein’s General Theory of Relativity and the theoretical discoveries in quantum physics are pointing to the intellectual trend of describing reality in dialectical terms. The Hegelian concept of ‘nothingness transforming into being’ through a dialectical process is similar to the doctrine of Dao from Lao Tzu and I Ching whose theory of the ‘void’ or ‘vacuum’ transforming through the big bang into the current physical existence of the universe is finding parallels in new physics. Dialectics, therefore, provide the logical structure for Syndrome Differentiation which looks at the body as a little universe where the Qi forces and the material Blood transform each other in the Yin and Yang relationship that characterises dysfunctions in the physiology of the human body. This brings in the important concepts of balance and harmony to pattern diagnosis and the analysis of the dialectical relationship between organs (Zang Fu 脏腑), Qi, Blood and Body Fluids （气、血、津液）. The methodology of the Eight Principles of Syndrome Differentiation is the most important guiding principle in the process of clinical diagnosis. The principles of Yin and Yang Differentiation summarise the contradictions between the other six principles which are Exterior and Interior Differentiation, Excess and Deficiency Differentiation, and Cold and Hot Differentiation. Exterior and Interior Syndrome Differentiation reflects the depth of the dysfunction. Excess and Deficiency Syndrome describes the quantitative dynamics in dysfunctions which require purging or replenishing; whereas Cold and Hot Syndromes reflect the nature of dysfunctions. In Syndrome Differentiation the Chinese physician seeks to balance the body and the internal organs in order to select the right treatment. The Chinese Medical theory of balance also finds parallels in Western medical theory of homeostasis which describes the brain’s function in directing the body’s own regulatory mechanisms for maintaining its internal balance. The latest discoveries in neurophysiology and the mechanisms of pain show two-directional pathways that are responsible for repairing the body. An understanding of these mechanisms can be integrated within the Eight Principles when differentiating syndromes related to pain. Theoretical advancements in Syndrome Differentiation go hand in hand with the advances in the Four Diagnostic (四诊) methods in determining and quantifying clinical signs and data. For instance, computerised imaging technology is one of the latest methods used for tongue diagnosis that “reveals the elemental rule of the changes of the tongue images…which were described with qualitative, tongue colour and quantitative analysis respectively”ii. A comparative study of Traditional Chinese Medicine, including the Four Diagnostic methods, and modern medical physics as well as biochemistry shows that Syndrome Differentiation methodology can be integrated to serve both syndrome treatment and Western medical interventioniii. A disease is categorised according to the signs and symptoms presented by the patient in accordance to diagnostic data, whereas a syndrome is a summary of the body’s reaction state according to the signs and symptoms collected by the physician using the Four Diagnostic methods and other diagnostic techniques. There is a distinction between symptoms, diseases and syndromes. Syndromes can also be described as patterns which express a holistic view of the body in health or disease. A syndrome, therefore, can include several diseases whereas a disease can be expressed in different syndromes. As a disease advances, syndromes change and transform into other syndromes. This is one of the reasons why Chinese Medicine is a subtle, individualised medical methodology that requires the physician to think within a theoretical framework – a system which has evolved through several thousand years of clinical experience. It distinguishes itself from Western medicine which has evolved through the application of drugs and surgery in more general terms according to disease categorisation. The relationship between differentiating diseases and differentiating syndromes is an area that must be investigated by integrative physicians in order to bring in a new approach to determining suitable treatment that will produce maximum benefit for the patient. By combining the micro-analysis and the macro-differentiation we may look forward to a synthesis. After all, the concept of Syndrome Differentiation was originally conceived in Shang Han Lun (伤寒论)iv nearly two thousand years ago. It is now time for further innovations that will bring Chinese Medicine into 21st Century. The Principle of Yin and Yang Differentiation serves as the overarching method for differentiating the other six principles. Exterior Syndrome, Heat Syndrome and Excess Syndrome belong to the Yang Syndrome, whereas Interior Syndrome, Cold syndrome and Deficiency syndrome belong to the Yin Syndrome. All other special categories of syndrome Differentiation can be summarised by the Eight Principles which serve as the general framework. To differentiate the Zang Fu organs we also need to refer to the Eight Principles, and the same applies during the differentiation of disease causes and differentiation of the meridians which are the processes that go into the deeper details regarding a particular dysfunction. The disease causes of the External syndromes are related to the invasion of the Six Pathogens that cause aches and pains, fever and cough with clinical signs of thin white tongue coating and floating pulse. The Interior syndromes, which include many chronic diseases, can be attributed to a deepening of a dysfunction within the body that involves Zang Fu organs, Qi, Blood and Body Fluids as well as the musculoskeletal system. There are also categories of syndromes that are half Exterior and half Interior. Interior diseases generally produce many different kinds of tongue pictures, usually with thicker tongue coating, while the pulse tends to be taut or deep. In the Exterior Heat syndrome, one of the clinical features is an aversion to cold, whereas in the Interior Heat syndromes the clinical features are fever without any aversion to cold or cold without fever. When there are many changes in the tongue pictures it is an Interior-related syndrome whereas few changes on the tongue indicates an Exterior-related syndrome. In the Exterior syndromes the pulse is floating while in the Interior syndrome the pulses are usually deep. There is a struggle between positive Qi and negative Qi which produces an interchange of heat and cold, dry mouth, dizziness and a lack of appetite in the patient. It is the syndrome that can be described as being in between the Exterior and Interior and in this case the pulse is usually of a taut quality. The Cold syndrome is described as Exuberance of Yin and Deficiency of Yang, whereas a Heat syndrome manifests itself through an Exuberance of Yang and is characterised by Deficiency of Yin. There are complicated variations of these syndromes that can be described as ‘True Cold, False Heat’ and ‘True Heat, False Cold’ which involve the Yin counteracting Yang or vice-versa and producing different clinical features in tongue appearance and pulse. Deficiency and Excess syndromes describe the quantitative state of the body in terms of vital materials and energetics relating to an organ or several organs according to the Chinese Medical principles of the physiology of the body. The unique concept of the interactive relationship between Qi, Blood and Body Fluids is also of paramount importance in differentiating Deficient and Excess syndromes. For example, psycho-emotional problems such as stress, depression, anger, etc. can cause Stagnation of Qi of the Liver and the Liver meridian. This is an Excess syndrome which can be treated by Chinese herbal prescription and acupuncture. The treatment principle is to soothe Liver Qi and unblock the Liver meridian in order to prevent the syndrome from developing further into a complicated dysfunction involving the Spleen or the Heart that might result in disorders such as insomnia or irritable bowel syndrome (IBS). When the Kidney is being involved then a whole range of problems such as chronic tiredness and immune-related dysfunctions can arise. This is how we can establish the significance of Syndrome Differentiation in treating a number of diseases and removing and regulating their root cause. The Blood Deficiency syndrome can be caused by Spleen Qi deficiency or Heart-Yin deficiency which in turn becomes complicated with Excess syndromes such as Blood Stasis and Damp-Heat in the Stomach that cause gastric ulcers and digestive diseases. When complicated with other Deficiency syndromes such as Heart Deficiency or Kidney Deficiency a number of other diseases can develop as a result; such as insomnia, amenorrhoea, irregular menstruation, erectile dysfunction and other gynaecological and andrological disorders. The complexity of the interrelationships between syndromes can be explained with the Chinese Medical approach to pain. One of the syndromes related to pain is described as ‘Blood Stasis’ which can occur from either external injuries or internal injuries (one can lead to another). Understanding the relationship between Blood and Qi is useful in resolving Blood Stasis in order to relieve pain. It is well known in Chinese Medicine that when the Qi moves, Blood moves. Therefore in order to remove pain by resolving Blood Stasis we have to invigorate or tonify Qi. Since in Chinese Medicine Blood is a source of Qi, in many cases we have to tonify Blood to invigorate Qi, otherwise the source of Qi is left exhausted. In treating pain-related syndromes, understanding this relationship in Chinese Medical treatment is paramount. The efficacy of acupuncture in treating pain also draws on the understanding of the relationship between Blood and Qi which is what distinguishes Syndrome Acupuncture from the Western Medical Acupuncture and its symptomatic approach. Acupuncture treatment not only triggers off a neurophysiological response by releasing different neurotransmitters such as endorphin and enkephalin in the body’s opioid receptors but also blocks the transmission of pain signals to the brain, according to the research of Professors Wall and Melzack in their Textbook of Pain. However, in the author’s opinion the even more important factors in pain management can be explained by the two-pathway mechanism in the brain’s response to pain. Besides the process of homeostasis, the brain memorizes the pain within its neuron networks, hence the need for treatment of phantom pains of amputated limbs by using acupuncture points on the opposite limb. The established approach in acupuncture within the mainstream Chinese Medical system is to select the acupuncture points according to the principles of Syndrome Differentiation which is an important protocol that produces more effective results when combined with Chinese medical herbal treatment. It is of great regret that the majority of acupuncturists in the West only practice symptomatic Medical Acupuncture, but then sometimes acupuncturists use distal points, e.g. LR3 for headaches and stress without realising that the reason behind the selection of this point lies within the principles of Meridian Differentiation. There is an urgent need for physicians and students alike to receive structured education in Syndrome Differentiation that will deepen their understanding of this integral component of Chinese Medical practice. Their clinical results will thereby be enhanced for the benefit of the patients. When we consider the functional state of Zang Fu organs – i.e. whether they are suffering from Deficiency, Excess, Hot or Cold syndromes – the diagnostic process cannot be divorced from the categorisation of Yin and Yang syndromes. For instance, a Cold syndrome is defined as the Exuberance of Yin and the Deficiency of Yang and a Hot (Heat) Syndrome can be defined as the Exuberance of Yang and Deficiency of Yin. Other complicated syndromes such as ‘True Cold and False Heat’ and ‘True Heat, False Cold’ can also be defined by the relationship of Yin and Yang and the related clinical features. The concept of Zang Fu relationships in the theory of Five Elements can be described in modern terms as an interaction of the materiality of organ tropism. The Chinese describe the organs by associating them with natural elements such as Metal, Wood, Water, Fire and Earth. The theory of Five Elements summarises the nature and tendency of organs as well as their interrelationships. Such relationships can be researched and expressed in modern scientific terms by using system biology, molecular medicine or – in the future perhaps – quantum medicine. In this article the systematic analysis of syndromes looks at the clinical application of Syndrome Differentiation within internal medicine to further the East-West medical integrative approach and enhance clinical efficacy. “TTR expression levels in tumour patients indicated that TTR expression was strikingly decreased in human primary hepatic cancer, leptomeningeal metastasis of breast cancer, cholangiocarcinoma, and lung cancer. Therefore, we inferred that the incidence of cancer might be increased in chronic stress-induced GSS and in which the decreased TTR level may play a role in the course of carcinogenesis”vi. This indicates that the development of cancer is closely related to the syndrome “Stagnation of Liver-Qi” and internally linked with another syndrome which is “Deficiency of Spleen-Yang” since the organ Liver (Wood) is affected by emotions and stress and has a restraining effect on the Spleen (Earth) which is the organ related to the immune system in both the Chinese and Western medicines. By treating both syndromes you can prevent the progression of cancer because you will be able to control the tumour or the metastasis and at the same time minimise the toxic side effects of chemotherapy and radiotherapy. Syndromes change according to different stages of the cancer and the progress of the patient and therefore an existing syndrome can transform into another syndrome. If an existing syndrome is treated according to correct Syndrome Differentiation then both the quality of the patient’s life and the prognosis will benefit. Chinese oncology is unique in describing the syndrome that manifests in cancer patients as Accumulation of Phlegm and Heat Toxins resulting from chronic dysfunction in Liver-Qi Stagnation, Blood Stasis and deficiency in the vital organs. Chinese pathogenesis can be linked with specific features of Chinese aetiology in terms of lifestyle and emotional imbalances as well as pathogenic factors besides genetic factors. The management of cancer and palliative care in Chinese Medicine has proven to be effective when using acupuncture, Chinese herbal medicines and Chinese Yang Sheng therapy (‘health cultivation through lifestyle changes’). The recent research on various Chinese herbs and compounds shows promising effects on different types of cancer. A number of European studies on the use of Chinese herbal compound Dang Gui Long Hui Wan (当归龙荟丸) for the treatment of leukemiavii provide an example of the multi-target medical model which is more suitable for the Syndrome Differentiation approach to treatment. This particular formula is used to clear and purge Fire from the Liver and gallbladder in order to treat leukaemia as a disease. 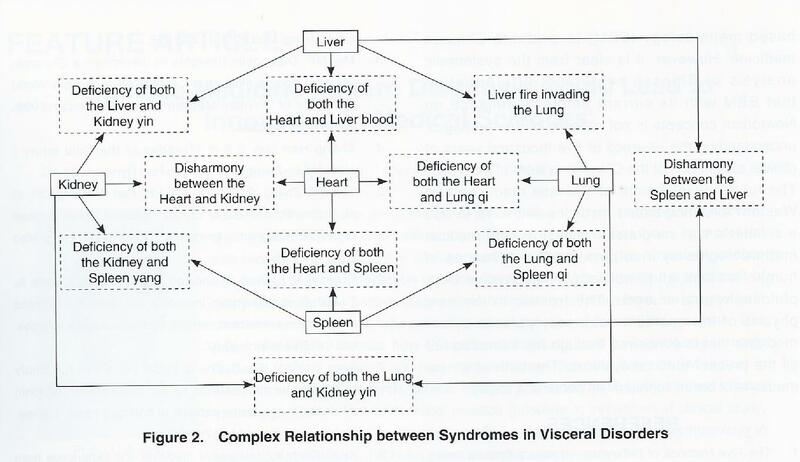 The clinical application of Syndrome Differentiation to the Metabolic Syndrome-related diseases is unique due to Chinese Medicine’s understanding of the close interactions between the physiological and the psycho-emotional factors which are linked to lifestyle. The Chinese Medical syndromes involved can be both general as an overarching treatment of the metabolic syndrome and specific to a particular disease such arteriosclerosis, diabetes, hypertension or obesity. In terms of arteriosclerosis, the main syndrome characterising this disease is Blood Stasis which can apply to other coronary heart diseases. The conclusion in ‘The Study on the Tongue Manifestation for the Blood-Stasis and Toxin Syndrome in the Stable Patients of Coronary Heart Disease’viii is that the patient generally has a blue-ish and purple tongue, purplish-red sublingual vessel and the tongue coating changes from sticky, greasy to dry greasy which signifies the transformation of the toxins. Such a study verifies the traditional records on the tongue features of Blood Stasis. Syndrome Differentiation is ideally suited to the diseases related to metabolic syndromes in both diagnosis and treatment due to the fluidity of its methodology. Patients suffering from diabetes mellitus who have syndromes such as Kidney-Yin Deficiency and Liver-Qi Stagnation can also experience a further transformation of their syndromes into Heat syndromes that cause Blood Stasis. This is the syndrome often seen in coronary heart disease patients. Syndrome Differentiation is therefore an efficient method for treating patients with complicated metabolic syndrome diseases, especially when hypertension and cholesterol problems are involved. The differentiation of Yang Sheng lifestyle syndromes can also be used to analyse the patient’s improper lifestyle in order to regulate the syndromes. For instance, insomnia can be caused by the exuberance of Fire in the Heart as a result of dysfunction of the Liver caused by stress. In order to treat insomnia we have to soothe the Liver and calm the Heart by tonifying the Heart-Yin. Syndromes of other cardiovascular diseases can be further divided as Hot or Cold accumulation of Dampness and Phlegm. We can use the Eight Principles method, the Yin and Yang categorisations, the Interior and the Exterior as well as the Deficiency and Excess syndrome differentiation in relation to the vital organs in order to achieve the overall multi-target treatment that reflects the Chinese holistic approach. Let’s take a look at the function of Kidney in Chinese Medicine in relation to treatment of renal diseases, as part of this systematic analysis of Syndrome Differentiation as a clinical methodology. In Chinese Medicine Kidney is the source and the storage organ of the body’s energetics ‘Qi’. In Chinese medicine Qi is divided into Congenital Qi and Acquired Qi. Both ageing and lifestyle can affect the quantitative and qualitative aspect of Kidney Qi which is further divided into Yin and Yang. When we look at gynaecological disorders such as infertility, ammenhoreia and the andrological disorders such as erectile dysfunction we must take into account the syndromes related to Kidney and to the decline of ‘Tianqui’. Therefore tonifying the Kidney Yang and/or the Kidney Yin is the root treatment for many diseases. Deficiencies of the Kidney means there is a lack of Qi and Essence such as Blood and Body Fluid to sustain the body. In Western medicine chronic renal failure (CRF) is the end result of long-term kidney disease since damage to kidneys is a lengthy process. With Chinese Medicine we can slow down the process of such development; reduce the clinical symptoms and raise the quality of the patient’s life. In older patients the Kidney function generally declines according to their age. According to Chinese Medical experience, the Kidney Qi begins a qualitative decline in women after the age of 49 and in men after the age of 64. We can use Chinese Medicine and acupuncture to regulate and invigorate the Kidney function according to the Zang Fu relationships in terms of Syndrome Differentiation. The correct Syndrome Differentiation of the Kidney, in relation to the Spleen, Liver, Heart and Lung as well as their corresponding Fu organs, will enable the Chinese physician to deal with not only renal diseases but other diseases and dysfunctions of internal medicine, as well as providing the treatment for slowing down the ageing process. One of the key features of the Kidney is a tendency towards Deficiency Syndromes such as Yin Deficiency, Yang Deficiency or both Yin and Yang Deficiency. In more complicated cases, internal diseases of different nature can be individually described as a combination of syndromes with complex interrelationships which produce different features and symptoms. For example, the syndrome of Genuine Deficiency with Excess Pathogens describes the deficiency of the Spleen and the Kidney affecting other organs with injury of the Yang that causes the injury of the Yin – or vice-versa – which in turn causes dysfunction of Qi and Blood which results in serious injuries to both Yin and Yang. In such case the patient will also show the signs of water retention, dampness retention and the development of phlegm, besides other symptoms and clinical features that relate to Kidney and Spleen Deficiency. This example illustrates the complexity of the interchanges and the mutually transformative nature of syndromes. The ability to recognise and differentiate the web of the individual patient’s disease patterns is a necessity for an experienced physician and has become the essence of Chinese Medicine. We must understand that the practice of Syndrome Differentiation is about regulating and readjusting the state of the body’s constitution in order for the patient to deal with the disease and return to health. This is different from medical intervention as practiced in the Western medicine. The struggle between the body’s Genuine Qi against Pathogenic Qi (‘Evil Qi’ in Chinese Medical terminology) is an important tenet in Chinese Medicine. In order to support the body’s Genuine Qi we need to tonify the internal organs to balance the organ relationships and the Yin and Yang manifestations of the body. We must also use Chinese herbs and acupuncture to purge the pathogens by regulating Qi, Blood and Body fluids. From the above analysis we can establish that Chinese Medicine – as a system of medicine – is very tightly woven in its theory, diagnosis and treatment. This methodology has undergone several thousand years of clinical experience that defined its clinical efficacy. Brilliant physicians of the past have contributed to the theory, techniques and herbal formulations that are valuable to modern medicine. Looking back at the development of integrative medicine as a result of the revitalisation of Chinese Medicine over the past five decades or so, we can make the following judgements. First, Syndrome Differentiation as a methodology can contribute towards the individualisation of treatment which is the developmental trend of modern medicine. This is necessary because cancer, AIDS, metabolic and other diseases are getting more complicated in their manifestation patterns and more difficult to cure for Western drug and surgery interventions. A holistic view of diseases is also becoming an important orientation for future medicine in which single target-treatment may be replaced by multi-target treatment protocols. The concept of a cocktail of drugs for the treatment of AIDS and many other metabolic syndrome-related diseases is an illustration of the future direction of clinical practice. There are also those who want to use Evidence Based Methodology (EBM) to evaluate Chinese Medicine. However, it is clear from the systematic analysis of Chinese Syndrome Differentiation that EBM with its current empirical reliance on Newtonian concepts is not capable of interpreting or understanding the essence of five thousand years of clinical experience of the Chinese system of medicine. The future development of Chinese Medicine and Western Evidence Based Medicine (EBM) will have to find a synthesis that integrates the best of both medical methodologies by incorporating the advances in human wisdom and knowledge that involve both philosophy and science. The frontier in the new physics of the quantum fields may point to a new medicine that is conceived through the interaction of all the present medical systems. The birth of a new medicine of our millennium will become a reality. vii Ralph Hassel et al, Nature Cell Biology (University of Kaiserslavtern, Germany, Cell Cycle Laboratory CNRS, France, Laboratory of Molecular Biophysics, Oxford).